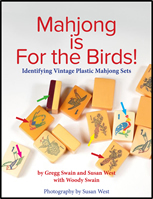 New York, NY: Mahjong collectors Gregg Swain and Susan West have teamed up with Woody Swain, a graphic designer (and Gregg’s husband), to produce the first-ever guide to vintage plastic Mahjong sets. Every day, very costly mistakes are made by buyers and sellers who have no idea of a set’s value. This e-guide will change all that. It will help Mahjong owners determine what kind of set they have, and begin to ascertain its value. Although there are no prices in the guide – the market is very fluid and much depends on the condition of the tiles and accessories – it will instruct people on the relative rarity, and thus desirability of the sets, without going out of date. Given that sets can sell from between $75 to several thousand dollars, it’s a must-have for anyone with an interest in buying, selling, collecting or appraising vintage sets made of materials like Bakelite. The "Add to Cart" button links to NORTH AMERICAN purchasing and shipping costs. Co-author of Mah Jongg: The Art of the Game Gregg Swain, whose website www.mahjongtreasures.com has gained more than 100,000 views from people in 117 countries, knew from experience that there was a need for this guide. A contributor to Mah Jongg: The Art of the Game, runs the website www.mahjongmahjong.com, which serves as an Internet resource, salesroom, and museum. “It’s a delight to open my in-box each day and meet fellow Mahjong enthusiasts, players, and collectors from all over the world. We all have something in common – a fascination and love for these wonderful old games and a deep-seated pleasure in learning more about the sets we own or have seen.